In the mid-30s the navy was supporting development of three types of variable-pitch propeller: the Hamilton-Standard hydraulic controlled system, the Curtis Electric propeller, and the SMITH propeller that was operated entirely mechanically. The pilot had a manually operated control in the cockpit by which, through mechanism, he could vary the pitch of his propeller blades. 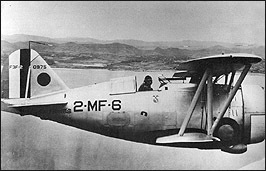 Early Grumman biplane fighters joining the fleet were equipped with SMITH propellers. Remember those pregnant looking fat-bellied airplanes with retractable landing gear? And one of these, taking off from an aircraft carrier out of San Diego suffered loss of power on launch and went down into the sea directly ahead of the oncoming carrier. They had the good fortune to be able to get a line to the floating aircraft; legend leaves some doubt that the pilot even got his feet wet. The airplane was promptly hosed down with fresh water and, brought ashore, was soon packaged onto a railroad car and shipped to the Naval Aircraft Factory at Philadelphia Navy Yard for cleaning, repair and refurbishment, inspection, flight test and return to the fleet. This included complete teardown examination of the SMITH propeller and re-assembly with the blades carefully reset to their proper pitch. They turned to some old aviation chief there and said, "Go look at the guy's airplane." He's back in 10 minutes, lit up like a lamp and he says, "Excuse me Lieutenant , you said you checked that airplane?" "You say TWA checked it, and American checked it, etc . ?" "If I'm not asking too much Lieu- tenant," he says, "will you come out and look at the airplane with me?" They go out and the chief says, "Just look at it." 'Yeah, well ... ?" He couldn't' see anything wrong. "Lieutenant, will you please step over and pull the engine through?" The minute he put his hands on the propeller, he lit up! He knew! His hands were curled over the rounded leading edge of the propeller! The SMITH was perhaps the only propeller in history where you could get the blades in backwards! The pitch of the blades had been set accurately at Philadelphia, on the big steel surface plates with big protractors and everything, but they were 180 degrees around! And this thing had flown across the continent with the sharp trailing edge plowing ahead and the rounded part on the back. Of course, in the Navy, every incident gets written down on a piece of paper. The form was known as a Trouble Report. Roy (Grumman) had this thing, this Trouble Report saying, 'Propeller blades in backwards' framed and displayed for many years. His wonderful new airplane had just crossed the country with the propeller blades on backwards!